Ocho Rios Resort is a lively tourist orientated town on the north coast of Jamaica. It is located about 66 miles east of Sangster International Airport Montego Bay. Ocho Rios is an ideal location for exploring Jamaica's beaches, famous tourist attractions (including Dunn's River Falls Park, Bob Marley Mausoleum, Fern Gully, Dolphin Cove...), shopping, restaurant and lush surrounding countryside. The resort development of this delightful parish, however, has centered round the town of Ocho Rios. Holiday accommodations in Ocho Rios are well suited to all visitors ranging from the budget end to more luxury five stars. Most of the major hotels in Ocho Rios holidays are on an all inclusive basis, but those who are looking for villa rental, self catering apartments/hotels and room only are well catered for. The main Ocho Rios beaches have calm safe water, protected by tropical coral reef and have life guards on duty during the day. Ocho Rios beaches can be found in a series of small coves and large white sandy beaches along its coastline. The public beaches are clean (looked after by a dedicated team of workers during opening hours) with bathroom facilities including showers, changing rooms and lockers. The beaches that are owned by the hotels offer all the amenities that you come to expect. Ocho Rios beaches can be found in a series of small coves and large white sandy beaches along its coastline. 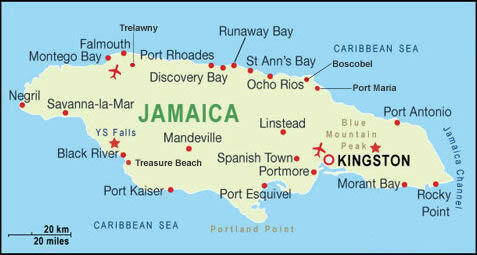 Ocho Rios is an ideal location for exploring Jamaica's beaches, famous tourist attractions. Ocho Rios is a great water sports destination for the adventure seeker and sports fishermen. You can enjoy a wide range of water sports such as scuba diving, deep sea fishing, jet skiing, para sailing, snorkelling... Land lovers are also well catered for in Ocho Rios with activities include tennis, climbing the famous Dunns River Falls, horse back riding, white water rafting, quad biking, swimming with dolphins at Dolphin Cove, Green Grotto Caves, jeep safaris, helicopter tours and many more. The restaurants in Ocho Rios serve up a variety of seafood, international cuisine and spicy local seasonal dishes. You can sample some of the local Jamaican cuisine in one of the smaller Ocho Rios restaurant. Nightlife revolves around Ocho Rios hotels with their cabarets, live bands, discos and beach parties. Ocho Rios is also one of Jamaica's best spots for duty free shopping, souvenirs and jewellery. Most of the popular shopping centers are located in the center of town and all within walking distant of each other. Check out the popular Ocho Rios Craft Market, Old Craft Market, Ocean Village Shopping Center, Taj Mahal shopping center.